If you love atom like me, this is how you can enhance it to be your best companion. I love my editor, Atom. I have tried most of them out there and still, I always come back to this one. It is not perfect but I find my peace in its imperfection. Here are few things I do to make my Atom awesome. I am a connoisseur when it comes to beauty. If you want me hooked, be beautiful. I love beautiful code and here is what I do to make my editor look beautiful. 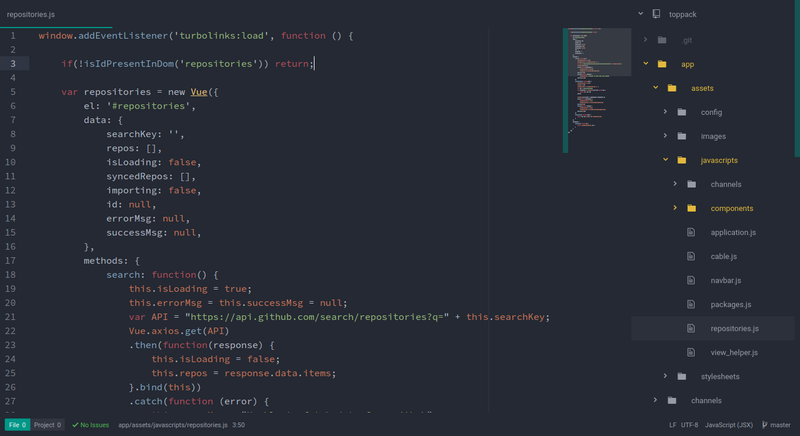 I use Atom Material UI, there are people who may not like this theme but I perfectly adore this. This is the most important things you can have in your editor, the right syntax colouring can do magic. This can increase your productivity, reduce eye strain and make the work enjoyable. I take my eyes very seriously so should you. I use Spacegray Atom Dark Syntax. The syntax highlighting in VS Code is better than Atom, but that is a discussion for another day. The font I personally use is Source Code Pro, I also like to use Fira Code for its symbol translations. Atom is modular in structure and everything can be added as a package. Here are few packages I use to speed up my workflow. This is a huge time saver, helps me autoclose HTML tags. If you have ever navigated a huge codebase you know how many functions it can have and this package helps fold functions and just see their prototype. This seems like a useless plugin, but I miss it when it’s not there. I use it to scroll and navigate the codebase. This is a must have. Most of the editor has this built in, but we can always install the extension in the atom and make it work. It helps me highlight a word and find all its instances. I also install a version which shows highlighted words in minimap too. If there is anything that you feel I should try, feel free to let me know. My arsenal is always empty for cool technologies. Thanks for reading.